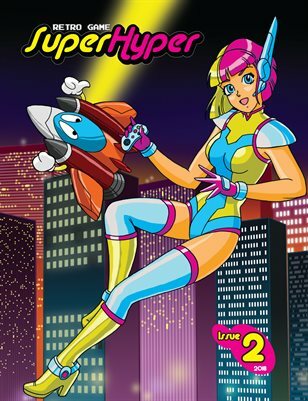 That’s right, you heard right — after a long delay, the second issue of the Retro Game SuperHyper fanzine is finally done, in the can, put to bed, uploaded, out and available to buy RIGHT NOW! RGSH #2 is 36 full-color pages of original, zine-exclusive content, as well as a few of my favorite articles from the second year of the blog! Interview with SaruMaru, creator of FX Unit Yuki! Essay, Has Retro Gaming Gone Mainstream? Q&A with Aaron Kraten, noted shmup collector and enthusiast! A guide to mini arcade games! The Story of Deathstalker: A resurrected laserdisc arcade game! How to Beat Pitfall! – A guide to finishing the Atari 2600 classic! YOU CAN DO IT! Artwork, cartoons, and game photography! Plus a few of my favorite articles from the blog’s second year, including Why Shmups?, Lost and Found and Lost Again: Chantze’s Stone, and That Time I Almost Won a Street FIghter II Tournament, with fresh layouts and tons of graphics! Here’s a flip-through video of the new issue! As with the first issue, RGSH #2 is available in a physical printed edition, as well as a downloadable PDF — but print orders include the PDF as well! I had originally intended to get it out back in October, and as such, I decided to keep the date of 2018 on the cover. Unfortunately, a number of things delayed the zine’s release. I got frustrated and even almost gave up. But I got inspired, pushed through and got it finished, and I am so happy I did. I’m very proud of this ‘zine, and if you like and appreciate physical magazines and independent publications as much as I do, I hope you’ll check it out. Oh, I almost forgot — if you like the cover artwork, there’s a new t-shirt of it available at my TeeSpring shop, too! As always, thanks for your support! !